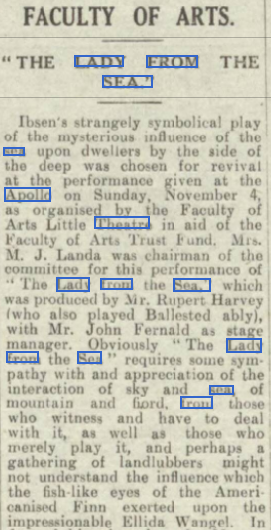 "The Lady from the Sea" was produced at the Apollo Theatre, London, on 4 November, 1928 (single performance). The cast, apart from Charles Mortimer, included, Audrey Cameron, Rupert Harvey, David Horne, Ruth Landa, and Muriel Pratt. It was produced by Rupert Harvey. From The Era 24 October, 1928. Faculty of Arts Little Theatre. 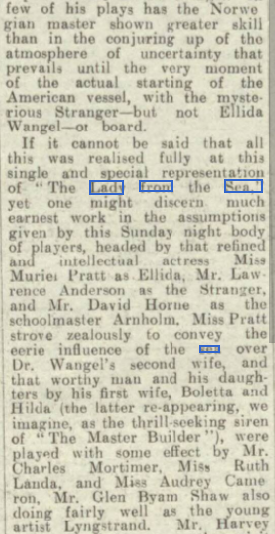 Ibsen's Lady from the Sea will be given at a dramatic performance, organised by the Faculty of Arts Little Theatre, at the Apollo, on Sunday, Nov. 4th. The performance will be under the patronage of the Egyptian Charge d'Affaires and other distinguished people. The cast will include; Muriel Pratt, Audrey Cameron, Ruth Landa, Lawrence Anderson, J Leslie Frith, Glen Byam Shaw, Charles Mortimer. and the play will produced by Rupert Harvey. Incidental music specially composed by Fred Adiington and Cecil Dudley will be performed by the West London Concert Orchestra, under the direction of the composers. From The Era 7 November, 1928. "Charles Mortimer was a feckless. self hearted Doctor"
The wife of a doctor moves to a small Norwegian town in the mountains, away from the seaside fjord where she grew up. When her ex fiancé, who was a sailor, returns after a long absence, she has to choose between her former and her present life. 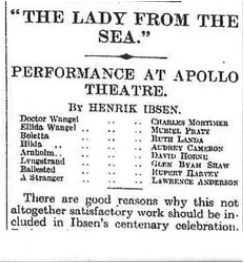 The play was written by Henrik Ibsen in 1889. 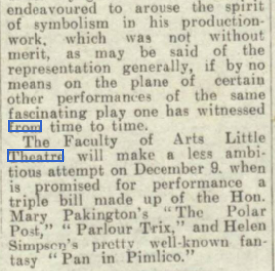 From The Stage - Thursday 08 November 1928.